Cheese balls are the perfect addition to any party. This version is filled with spicy jalapenos, sweet peaches, and zesty chives, all coated in black sesame seeds to give it a dark and creepy look. It will go perfectly on your grown-up Halloween snack table since the cheese ball is creepy without looking childish (No fake ghosts or mummy hot dogs here!). The sophisticated appetizer will work beautifully with any Halloween theme. In fact, you can create a whole dark cheese board using a cheese slate and adding dark Kalamata olives, and dark cured meats like capicola or salami. While it is softening, place the peach jam in a small saucepan. Dice the jalapenos, leaving in as many seeds as desired. If you want the cheese ball to be less spicy, remove all of the seeds and ribs of the jalapenos. If you want a spicier cheese ball, just leave all of the seeds and ribs when you dice the peppers. The more seeds, the spicier the cheese ball. Add the diced peppers to the peach jam and heat on medium-low heat for about 5 minutes, stirring frequently. Set aside and allow to completely cool. In a large bowl, combine the cream cheese, cooled peach mixture, chives, and salt. When they are completely combined, place it on a sheet of plastic wrap. Wrap the plastic wrap around the mound of cheese and twist the ends of the plastic wrap to form the mixture into a tight ball. Flip around so that the twisted wrap is on the bottom and place in the refrigerator for about 1 hour or up to 1 day. Remove the cheese ball from the refrigerator and carefully remove the plastic wrap. 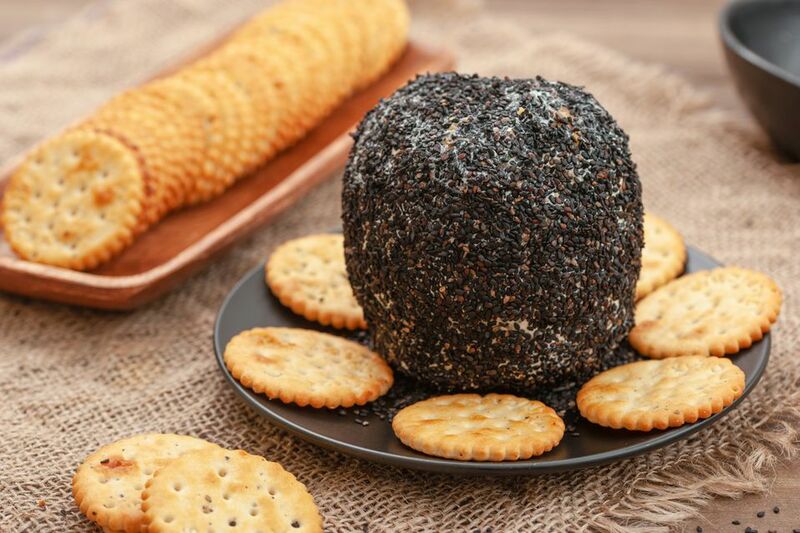 Coat the cheese ball in the black sesame seeds using your hands or by rolling in a bowl filled with the seeds. Place on a serving tray. Serve alongside dark crackers to complete the creepy look. Be sure to leave your cheese in the refrigerator for at least an hour or it will be too soft to form properly. Allow your cream cheese to soften before using; if not, it will be difficult to form into attractive balls. If you don't have time to allow your cheese to soften at room temperature, place it in the microwave for 10 seconds (but not longer) to soften it up. The peach preserves can easily be substituted for apricot. You can also mix up your own peach mixture. Just heat two diced peaches with a 1/4 cup of sugar and 1 teaspoon of cornstarch on medium heat until the mixture has thickened, then add in the chopped jalapenos. You can substitute chives or even strips of leek for the chopped scallions (also called green onions).